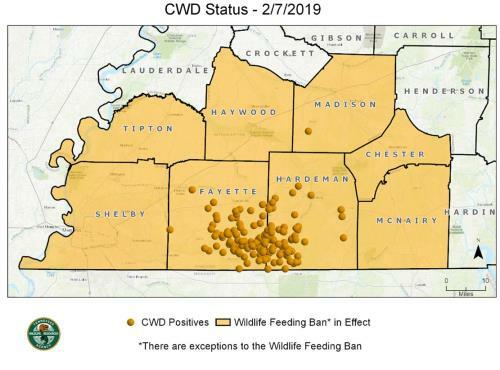 The Tennessee Wildlife Resources Agency has announced its initial chronic wasting disease (CWD) response efforts were successful in the agency sampling more than 2,700 deer for the disease in the CWD Management Zone with the assistance of hunters. The CWD Management Zone, established in December, has grown to include eight southwest Tennessee counties. The counties are Chester, Fayette, Hardeman, Haywood, Madison, McNairy, Shelby, and Tipton. Tipton County was just added this week upon confirmation of a CWD positive deer harvested near its border in the adjacent Fayette County. Statewide, TWRA was able to obtain samples from almost 5,400 deer during the 2018-19 deer hunting seasons. All CWD positives found were harvested in Fayette, Hardeman, and Madison counties. It will take until later in February for all the results from the samples to be received by the TWRA. Once the results are received and analyzed, final development of the long-term CWD management plan will be completed.